The uMzinyathi District Municipality is in the northern central area of the Province of KwaZulu-Natal. The district lies between the main N3 corridor from Durban to Gauteng and the coastal corridor, running along the east coast. uMzinyathi consists of the local municipalities of Endumeni, Msinga, Nquthu and Umvoti. 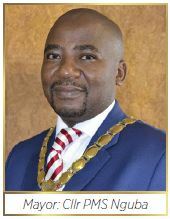 In conjunction with its north western neighbour, Amajuba District Municipality, uMzinyathi is branded as the 'Custodian of the Battlefields' region of the Zulu Kingdom. The battlefields form a vital role in the spatial economy of the province from a tourism perspective. The strong traditional culture present is an asset that provides support mechanisms for the local communities and is a living guardian of the Zulu culture. Other tourist sites include 13 private game reserves and one 18 000 ha proclaimed conservation area. There are two natural heritage sites: Fugitives Drift and Hlathikulu at Wasbank. Two wild cycad areas will be added to this list soon. Other significant sites include waterfalls, raptor breeding sites, a yellow wood forest and wetlands, including Paddavlei and Gladstone Vlei. Most industry in the area is associated with agriculture or hand work (carpets, beadwork) by trained artisans. The bottling of water has resulted in aQuellé becoming a national brand. 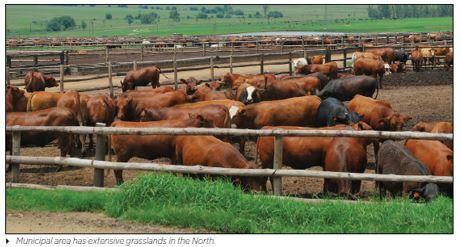 The municipal area has extensive grasslands in the north, supporting the primary agricultural sector based on cattle ranching for beef, small scale sheep and mixed farming and maize cultivation. In the southern areas substantial forestry is prevalent. Sugar cane and smaller scale fruit farming such as avocado and kiwi fruit cultivation also occur. The area has high potential for growth in agricultural crop production (maize, soybean and sugar cane). In rural areas, particularly at Umsinga and Nquthu, animals are not kept as farming commodities and are seldom slaughtered or sold. There is a need for farmer support programmes to improve stock management. It is important to broaden rural livelihoods through targeted agricultural production. There is very little product beneficiation with most products being exported to major markets for further processing and / or export. 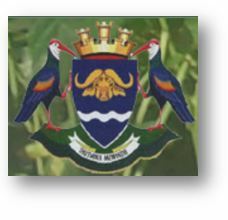 Endumeni Municipality is a key administrative, educational and economic centre for northern KwaZulu-Natal. Endumeni, with the smallest population, but the largest economy of the district, comprises the towns of Dundee, Glencoe and Wasbank, together with several farms. Dundee is the administrative seat of Umzinyathi and can be viewed as a strong regional centre with substantial commercial and agricultural activity. This municipality is unique; its population is predominantly urbanised or based on commercial farms and unlike the other local municipalities there is no tribal authority land. Endumeni's diversified economy includes commercial cattle farming and dairy production and tourism. Dundee and Glencoe form part of the Coal Rim of KwaZulu-Natal, that have over the past decade been negatively affected by a substantial decline in the coal mining sector which previously formed the economic base of the areas. However, the coal mining industry is undergoing a restructuring process and there is interest in the small-scale regeneration of the coal belt for SMME development. A small amount of stone quarrying occurs in the district. The Umvoti Municipality comprises urban areas, commercial agricultural areas and tribal authority areas all of which exhibit typical characteristics associated with these settlement types. The main town in the Umvoti Municipality is Greytown. It is the agricultural centre of the district and contributes substantially to the economic viability of the region. Nquthu Municipality is located along the north eastern boundary of the district. It is predominantly rural in nature, with expansive rural settlements being one of the major features. The municipality is mainly accessed through the R68 linking Ulundi to Newcastle/Dundee. Nquthu Town is a small but stable urban area that has established itself as the primary commercial, administrative and service centre for the municipality. Msinga Municipality is largely located in deep gorges of the Tugela and Buffalo Rivers, isolated from the immediate surrounding municipal areas. The population dynamics result in a growing rural area and a declining urban area in Msinga, contrary to most other areas in the country. Although the area has its challenges, there are historic sites, beautiful scenery and interesting topography in some parts, suitable for cultural and eco-tourism. Attention must be given to the formation of local partnerships for the development and marketing of the local tourism potential. The Msinga Community Tourism Organisation has been established to develop existing ventures such as the existing game farms to the northwest of the municipality linking with the Rorke's Drift and Isandlawana battlefields attractions, and the Tugela Biosphere to the southwest of the municipality. We are a united family of municipalities that champions service delivery through cooperative governance and public participation.